It is very important to grow an endowment for the future of B’nai Abraham Museum and Cultural Center. Many who come for tours, exhibits and programs often leave donations as well. 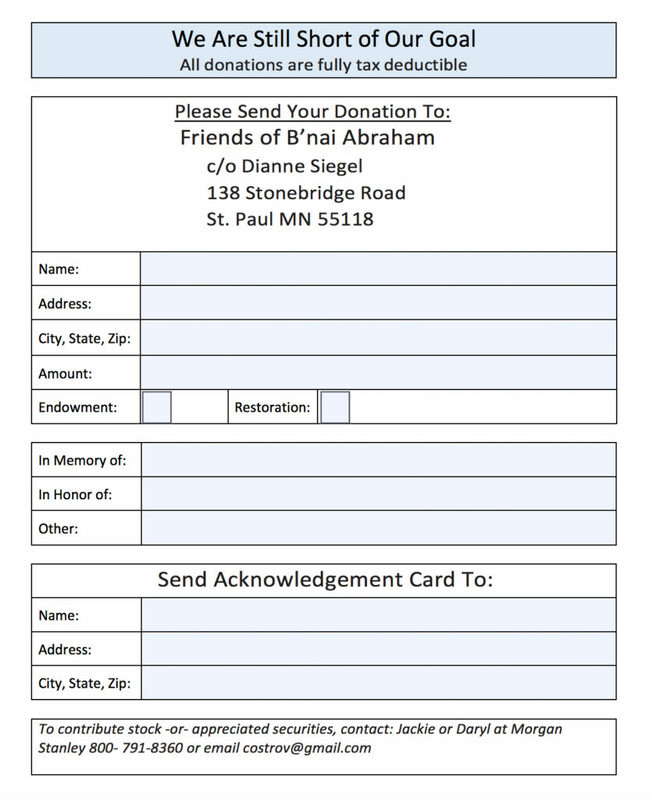 The Friends of B’nai Abraham has under taken this project to ensure that the building remains a community resource and ensuring that the contribution of the Jews of the Iron Range will not be forgotten. This building in particular, the only extant synagogue left on the Range, and the only synagogue building in Minnesota to be listed on the National Register of Historic Places, provides people with a window to under- standing the history of the Range and the Jewish people who contributed so much to its unique character. Tuck-pointing to close leaks and secure bricks, which will protect the beautifully restored building from harsh winters. The balcony floor needs to be sanded and refinished. Crown molding is needed in the sanctuary. To can download this PDF donation form: CLICK HERE! “B’nai Abraham represents our nations great religious, cultural and ethnic diversity. When historic buildings such as B’nai Abraham are lost, our nations magnificent mosaic loses some of its brilliant color.” ~ Board member, Marilyn Chait, PhD.